The translation problem arises from the fact that jiā 夹 has the following meanings: "press from both sides; lined (on both sides); place in between; carry something under one's arm; clip; clamp; folder; double-layered; sandwiched between; pick up (food with a pair of chopsticks); grip (a piece of iron with tongs)", etc. Unfortunately, faced with such a plethora of possibilities, translators all too often pick "sandwich", maybe because they're familiar with it as a food term. Thanks for letting me know. It will take at least two weeks to repair that, since the tech person for SPP is currently travelling. The translation actually seems pretty clear to me. When it comes down to it, we are all clothes sandwiches. Well, most of the time. Or "chothes sandwiches", as the case may be. I assume that's just a misprint. How many people read "clothes sandwich"? That's not what it says. We know that fluent native speakers of English do read right "over"
that other non-native readers of English might be even MORE confused! Ever since I read your comment about the translation being "pretty clear" to you, I've been racking my brains trying to figure out how that could be so. What part of the English speaking world are you from? I don't think the translation makes any sense, but it would be very difficult for a fluent English speaker to misunderstand the sign as a whole. I'm in the US, but "chothes sandwich" together with the picture got the point across. Your clothes might get caught between things like the middle of a sandwich. It's not optimal, of course. For a fluent English speaker who knows no Chinese, the translation by itself doesn't make sense. I think that the picture by itself — with the red circle — is fairly clear. Adding the "Be careful" makes it even clearer, but the "chothes" would start to make one wonder. If you were actually about to step on the escalator and saw the "sandwich", it might make you hesitate and perhaps even trip and hurt yourself. 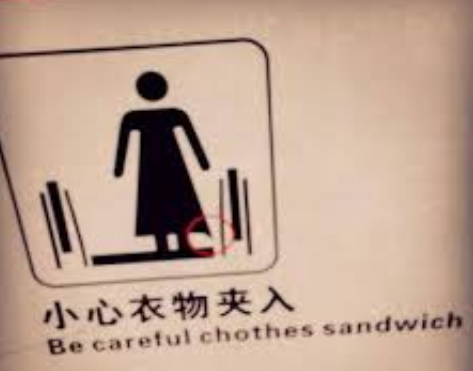 Change the sign to "be careful, clothes may be sandwiched". Remove the Chinese but keep the picture. Is the sign now passable as proper English? Reminds me of the time I was on an escalator that quit working – I was trapped for hours! >"translators all too often pick "sandwich", maybe because they're familiar with it as a food term." It's used quite often in technical writing/translation (e.g., http://www.patentgenius.com/patent/3997381.html) so my guess is that if a human translator was involved in this, it was probably been someone with this technical meaning. It's difficult to imagine someone familiar only with the food concluding that it would be appropriate in this case. Ah-ha. No editing. I thought it was a preview. >it was probably someone with this technical background. There's a basic principle that a warning sign accomplishes something if the person reading it can fashion a simple remedy to the hazard. 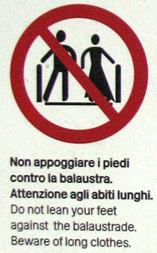 In this case, the problem seems to be women's skirts catching in the escalator mechanism, and so a hand in the picture shown drawing the skirt away from the side might do more than a proper translation of that sign. Otherwise the person is on the escalator facing the hazard with no remedy and no wiser about what to do. Meanwhile in Milan, English speakers travelling on the subway are warned to “Beware of long clothes”. A corrected version of issue no. 91 of Sino-Platonic Papers is now online: Phonosymbolism or Etymology: the Case of the Verb “Cop”, by Victor H. Mair.